Home > Departments > Faculty > Nathan Ahlgren Ph.D. Professor Ahlgren is a marine microbial ecologist. He is interested in understanding how environmental factors and interactions between microbes and viruses shape the evolution, diversity, and structure of microbial communities. Marine microbial communities are extremely diverse and control globally important cycles in the flow of nutrients and carbon on our planet. A fundamental component to understanding their importance to our planet is knowing what factors control and maintain the diversity and structure of these communities. Professor Ahlgren uses traditional culture isolation and laboratory studies along with cutting-edge DNA sequencing and bioinformatics approaches to elucidate key abiotic and biotic microbial interactions, including the impact of viruses on microbial communities. 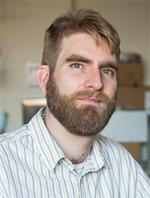 As such, his work addresses a variety of topics such as biogeographic patterns of microbial populations, models of microbial speciation, virus-host interactions, and the development computational tools for studying virus-host interactions.